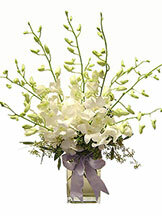 Twenty sprays of imported Dendrobium Orchids in a vibrant presentation that stands an impressive 32" tall. 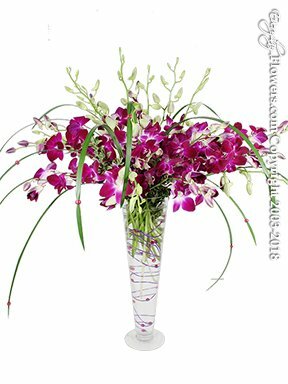 The vase is detailed with contemporary purple wire with red bead accents and red-beaded bear grass showers around. Contemporary romance in a long lasting gift.